The Computer History Museum (CHM) will honor Steve Jobs in a virtual exhibit including a rare presentation by the former iCEO. The exhibit is called “From the garage to the world’s most valuable company” and tracks Apple from its beginning to its recent rise to the top. The exhibit puts its collection of Apple-related material in the limelight with photos of the Apple I, an original Homebrew Computer Club newsletter and early pictures of Jobs in highschool. "For some crazy reason in the universe, two people from Los Altos and Cupertino, California managed to want something that just so happened to be what about a million other people wanted," CHM’s curator Dag Spicer says. What’s most interesting probably though is the rare video footage in which Jobs speak about how much luck had to do with the founding of Apple computers. Hit the source link below to tour the virtual exhibit. MOUNTAIN VIEW, CA--(Marketwire -12/05/11)- The Computer History Museum (CHM), the world's leading institution exploring the history of computing and its ongoing impact on society, today announced the launch of a new online exhibit on legendary Apple co-founder Steve Jobs. Called "Steve Jobs... First, Last, One more thing..." the exhibit traces Jobs's life from his youth building 'Blue Boxes' with partner Steve Wozniak -- devices that allowed its user to make free telephone calls -- to head of the world's biggest company. 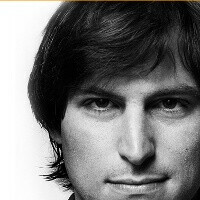 The exhibit features rare footage of Jobs from 1980 speaking about the early days of Apple. "We had no idea what people would do with these things," Jobs says in the video, describing the 1977 Apple II computer that launched Apple into a major technology company. "In Jobs's own words, we hear how luck as well as skill played big roles in Apple's founding," said Dag Spicer, CHM's senior curator. "We also see how focused, articulate and convincing Jobs could be, even at this early stage." Jobs, who seems to genuinely appreciate the magnitude of what Apple could be, remarks: "For some crazy reason in the universe, two people from Los Altos and Cupertino, California managed to want something that just so happened to be what about a million other people wanted." The new exhibit features objects from the Museum's permanent collection, which holds over 100,000 artifacts, including 3,000 Apple-related items. The new online exhibit also features photographs of Jobs and an essay on his life. Other unique and important early Apple documents in the Museum's permanent collection include the initial offering statement for the founding of Apple and the Macintosh business plan. Steven Jobs copied everything from Star Trek movies and patented as their own. and many more on the next page... and probably beyond that..
Hey, give him some credit and the others who helped - APPLE re-imaged, re-invented and sold and sold - at one in history it looked as if APPLE would close shop.